Though on the surface, there does not seem to be any similarity between endocrinology and anesthesiology specialties if one explores them in chthonic depth, a lot of common ground can be observed. 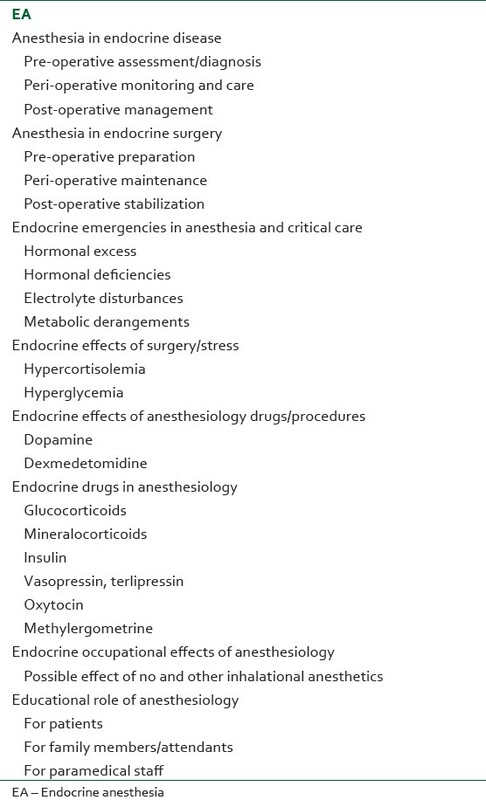 Endocrine anesthesia (EA), an amalgam of these two medical sciences, is fast becoming a distinct specialty on its own and the present editorial aims to focus on these. The choice of anesthesia is also determined by pathophysiological alterations due to different endocrinopathies related to pancreas, thyroid, parathyroid, adrenal, pituitary, and others. ,,,, Autonomic function and integrity is of utmost importance while formulating the plan of anesthesia. As autonomic dysfunction is commonly encountered in many of the endocrine disorders such as diabetes, adrenal disease, and other, pre-operative assessment and intra-operative vigilance is important. ,,,,, Equally, crucial is the assessment of cardiovascular status, neuro-muscular functions, renal parameters and various other organ systems, which are directly or indirectly affected by various endocrinopathies. However, it is generally felt that there is a relative shortage of endocrinologists in the developing countries, which makes it mandatory that intensivists should gear up to diagnose and treat such endocrinological disorders. Pharmaco-therapeutic properties of various drugs have to be kept in consideration during management of such patients in intensive care unit (ICU) and operation theaters. Most importantly, anesthetic drugs should be chosen on an individual basis as various anesthetic drugs are known to interfere in endocrine functions. ,,,,,, Dopamine, TSH, T 4 , glucocorticoids causing hyperglycemia in surgical patients are the best example of such pharmacological interaction. Though controversial, nitrous oxide has been incriminated as a cause of impaired sperm function and teratogenicity by acting on methionine synthetase enzyme. Concerns have also been ignited about the genetic modifications induced by the effect of inhalational anesthetics. At the same time, many endocrine drugs are being increasingly used in anesthesiology and intensive care practice. To enumerate, vasopressin antagonists for hyponatremia, insulin for treatment of hyperglycemia and hyperkalemia, use of testosterone for cessation of uterine bleeding, vasopressin, and terlipressin for stoppage of upper gastro-intestinal (GI) bleeding, glucocorticoids, fludrocortisone, and other steroids for various indications are a few of them. The clinical effects of these drugs have to be kept in consideration both during elective and emergency surgeries. Modern day medicine practice has been fast evolving as a team work among different specialties. Many clinical, practical, and legal reasons have compelled the physicians from various specialties to come together on a common platform to design various management strategies. Guidelines set by various international endocrinology organizations and committees do not address the issues faced by the intensivists and anesthesiologists. Guidelines by the endocrinologists do not highlight the role of intensivists. Anesthesia guidelines do not appreciate the role of endocrinologists. Furthermore, these guidelines have not been completely helpful as they are difficult to apply in totality in resource challenged settings. In spite of this, role of anesthesiologist has grown beyond the four walls of operation theater and ICU. An active participation of anesthesiologist is needed to successfully manage patients with endocrine disorders during pre-operative, intra-operative and post-operative period [Table 1]. Apart from that, motivation of patients to adhere to strict compliance of medication management in various endocrinological disorders can be carried out by anesthesiologist. Such opportunities can be availed during regional anesthesia and surgical cases being performed under monitored anesthesia care. During this period an anesthesiologist can greatly help in disseminating health education and the significance of adherence to strict therapeutic compliance regarding various endocrine disorders such as diabetes and can also convey various other simple preventive and therapeutic strategies. In the operation theater, a patient perceive doctor as next to God and is more likely to imbibe the advice delivered and adhere to various preventive and therapeutic regimens taught during such a crucial period. Similarly, the role of an endocrinologist is also underestimated in anesthesiology practice. Whenever feasible, an endocrinologist can be immensely helpful in preparing the patient for any elective or emergency surgery. Endocrinological milieu can be restored to normal before any surgical procedure with the help of an endocrinologist. Overall, such a closely co-ordinated team work can help in achieving a good anesthesia outcome thereby decreasing the overall anesthesia related morbidity and mortality. The increasing incidence and prevalence of various endocrinopathies in patients receiving anesthesia have necessitated that a new sub-speciality of EA be developed and nurtured. 1. Breivik H. Perianesthetic management of patients with endocrine disease. Acta Anaesthesiol Scand 1996;40:1004-15. 2. Niezgoda J, Morgan PG. Anesthetic considerations in patients with mitochondrial defects. Paediatr Anaesth 2013; 17:228-34. 3. Bajwa SS, Sehgal V. Anesthesia and thyroid surgery: The never ending challenges. Indian J Endocrinol Metab 2013;17:228-34. 4. Bajwa SS, Sehgal V. Anesthetic management of primary hyperparathyroidism: A role rarely noticed and appreciated so far. Indian J Endocr Metab 2013;17:235-9. 5. Yong SL, Coulthard P, Wrzosek A. Supplemental perioperative steroids for surgical patients with adrenal insufficiency. Cochrane Database Syst Rev 2012;12:CD005367. 6. Bajwa SS, Bajwa SK. Implications and considerations during pheochromocytoma resection: A challenge to the anesthesiologist. Indian J Endocrinol Metab 2011;15:S337-44. 7. Bajwa SS, Bajwa SK. Anesthesia and Intensive care implications for pituitary surgery: Recent trends and advancements. Indian J Endocrinol Metab 2011;15:S224-32. 8. Bajwa SJ, Kalra S. Diabeto-anesthesia: A subspecialty needing endocrine introspection. Indian J Anaesth 2012;56:513-7. 9. Bajwa SJ, Jindal R. Endocrine emergencies in critically ill patients: Challenges in diagnosis and management. Indian J Endocrinol Metab 2012;16:722-7. 10. Kalra S, Bajwa SS, Baruah M, Sehgal V. Hypoglycaemia in anesthesiology practice: Diagnostic, preventive, and management strategies. Saudi J Anaesth 2013;7:447-52. 11. Bajwa SJ, Kwatra IS. Reno-endocrinal disorders: A basic understanding of the molecular genetics. Indian J Endocrinol Metab 2012;16:158-63. 12. Bajwa SJ, Kulshrestha A. Renal endocrine manifestations during polytrauma: A cause of concern for the anesthesiologist. Indian J Endocrinol Metab 2012;16:252-7. 13. Vinik AI, Ziegler D. Diabetic cardiovascular autonomic neuropathy. Circulation 2007;115:387-97. 14. Gu W, Pagel PS, Warltier DC, Kersten JR. Modifying cardiovascular risk in diabetes mellitus. Anesthesiology 2003;98:774-9. 15. Scherpereel PA, Tavernier B. Perioperative care of diabetic patients. Eur J Anaesthesiol 2001;18:277-94. 16. Vuong C, Van Uum SH, O'Dell LE, Lutfy K, Friedman TC. The effects of opioids and opioid analogs on animal and human endocrine systems. Endocr Rev 2010;31:98-132.